A federal judge’s ruling allowing an American Airlines antitrust suit against Sabre, Travelport, and Orbitz Worldwide to proceed could provide some impetus for the parties to finally sit down and conduct some serious negotiations. Without ruling on the veracity of the claims, the judge decided that if the airline’s allegations were true, then they could be sufficient to support claims of conspiracy and monopoly. An American Airlines 767 on the tarmac. Photo by Simon Clancy. “… American has alleged sufficient facts sufficient to support a reasonable inference that Sabre, Travelport, Orbitz and other industry participants engaged in a combination or conspiracy to preserve the GDS model and exclude AA Direct Connect from the market and submarkets,” opined judge Terry Means in U.S. District Court, Fort Worth, Texas. American Airlines calculates that Sabre processes 60% of all airline tickets sold through U.S. travel agencies, and that Travelport handles 30%. By urging travel agencies and corporations to get their flight data directly from American Airlines instead of through the GDSs, the airline is seeking to reduce its costs and to usurp the power of the GDSs. With so much at stake for American Airlines and the global distribution systems — which would face serious disintermediation if other airlines follow American’s lead with direct-connect — there is an argument to be made that the latest rulling is just one in a series, and the parties will let this case and a handful of others play out in the courts. Attorney Al Anolik of TravelLaw.com, however, thinks the ruling could spur negotiations. “It’s enough of a scare that if I was the attorney for the defendants, I’d say, it is show time,” Anolik says, adding that the losing side in this antitrust skirmish would be responsible for paying the winner’s mega attorneys’ fees. Anolik says he would take his clients aside and ask them if they indeed phoned other defendants and conspired to stop American Airlines’ direct-connect push, or whether they got together for drinks and discussed as much at an industry conference. American alleges that the three defendants and other travel agencies banded together to rule out using American Airlines’ direct-connect technology, and to bias their displays so that American’s flight choices would be akin to disappearing ink. Sabre and Travelport orchestrated a conspiracy, with a helping hand from Orbitz, Expedia, the Business Travel Coalition, and the American Society of Travel Agents, to have travel agents and corporations shift their bookings from American Airlines to other carriers. A senior executive at Sabre, citing “a roadmap for AA plan,” told co-workers about a such a conversation he had with a Travelport executive. An Orbitz employee emailed people at Sabre, Expedia, BTC, and ASTA urging them to “stand together” against American Airlines. Sabre instructed employees to communicate verbally, if feasible, with senior executives and to avoid using words such as “bias” in emails. American, working its way through the bankruptcy court proceedings, clearly is anxious to settle things through negotiations. And, publicly, at least, the defendants are standing firm. Asked whether the judge’s ruling lent some credence to American’s allegations and serves as an impetus to negotiate, Travelport, for one, was having none of it. 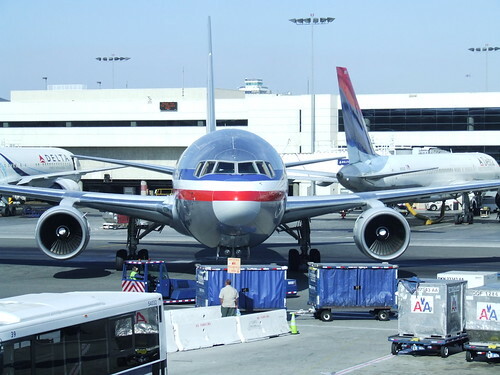 When American Airlines filed its antitrust suit in early 2011, there was lots of grumbling in the travel industry that the airline was grasping at straws, and that the claims had no merit. Then, when the airline filed for bankruptcy in November 2011, it was assumed by many that direct-connect would be a casualty. With the latest federal court ruling, it appears that American’s antitrust claims and direct-connective initiative still have some life.